Christmas is just around the corner so to everyone reading this magazine, Spirituality for Today, our sincere wishes to you for a very happy, beautiful, sacred Christmas Day. To all of you, a very, Merry Christmas. To make it a more sacred day and a more Merry Christmas with you, I would like to share a few thoughts with you concerning the meaning of Christmas, especially the personalities that make up the Christmas story. No matter where you go today there is no person in history that has captured the mind, the imagination, the thoughts of Jesus Christ whose birthday we celebrate. Personalities come and go in history, but his name, his personality goes on and on as it has been for about two thousand years. Imaginations are stimulated probably more at this season and for this event than at any time throughout the year. All of the Christian world has heard the expression, Glory to God in the highest and peace to people of goodwill. All of the Christian world knows that the hills of Judea were alive with the music of Angelic Choirs singing in the world of the birth of Messiah, in the birth of Jesus Christ. This is the story of the Christ child who would tremble as a piercing wind swept through an unprotected stable. The story of the boy carpenter, the boy and the man, who had compassion on the multitude. The man whose blood would spill on the marble pavement of Herod's palace. This is the adult who would hang from a cross on Good Friday, nailed between two thieves. It is quite a story. Can you think of any birth in history that has captured the imagination of the entire Christian world? He has prompted that volumes be written about him; Churches and Cathedrals be dedicated in his memory; schools and colleges be named after him. Millions would follow him. Thousands would die for him and people would just plain love him. It is quite a story. Angels, shepherds, wise men, stables, creches would never have the role to play in history if it were not for the Christ child whose birthday we celebrate. This is the Christ child who would be associated with the feast of the holy innocent, where other infants died because he was born. Herod was the murderer. This is the child that had to take flight into Egypt or possibly lose his life. The child who would work in a carpenter shop. The child, who when he became an adult, would cleanse ten lepers only to find that nine of the ten would walk away never showing a word of thanks. This is the man who would offer compassion and charity to the woman taken in adultery and simply say, go in peace and sin no more. The person who brought faith and hope to a people who were without either. The person who cured the mother-in-law of his apostle Peter. The person to whom children gravitate towards. 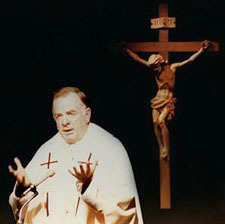 The person who would leave a blue print of love in the sermon of the Mount and leave a legacy of love in the Eucharist. The person who would go through an agony, a scourging, a crowning and a crucifixion to show his love for each one of us. Then he would rise from the dead so that each one of us would have the guarantee of God that there is a better world waiting for us in his kingdom, the kingdom of heaven. This Christmas story is quite a story. From this personality the world has been enriched by his teaching, his theology and his philosophy. Our families get together on Christmas Day, our family reunions, our feeling of peace, our feeling of happiness all come from this personality who was born in a stable almost two thousand years ago. What are we supposed to bring to each other on this day during this season? The same qualities that this same Christ child brought into the world on that first Christmas. He taught that we must love when he said in his own words, "by this commandment shall you love one another as I have loved you. By this shall all men know that you are my disciples if you love one another." The theology of love emanated, originated, in the little stable in Bethlehem centuries ago. His theology for forgiveness came from the same place. He said we must be willing to forgive and Peter, his disciple, said, "Lord shall we forgive seven times?" Christ said, "No, Peter, we must be willing to forgive seventy times seven times a day." We must forgive those who trespass against us, but we must forgive them for they do not know what they are doing. That same Christ, if he had the human voice he used during his public ministry, would say to the Jews and Arabs that they must forgive each other. He would say to the people in Northern Ireland, the Catholics and the Protestants that they, too, must forgive each other. He would say to every family where there is discord and dissension that they must forgive each other and get on with the job of life. Love and forgiveness. These are the teachings. This is the theology that comes from the first Christmas season. Christmas has to become in your life a time of peace, a time of love and forgiveness. Otherwise we lose the whole message that Christ brought on that first Christmas day. Christmas has to find us making an effort to heal those whom we have hurt and those who have hurt us. Christmas is reaching out to us the way Christ reached out to us from Bethlehem and from Calvary. Christmas is faith and hope for those who are in pain. Christmas is trust in God when things look dark in our lives. Christ centuries ago came into the hearts of the world to bring peace and love. The same Christ offers you peace and love if you practice what he preached, if you imitate what he gave us. Through being another Christ you cannot only better your own life you can leave the world a better place than you found it.